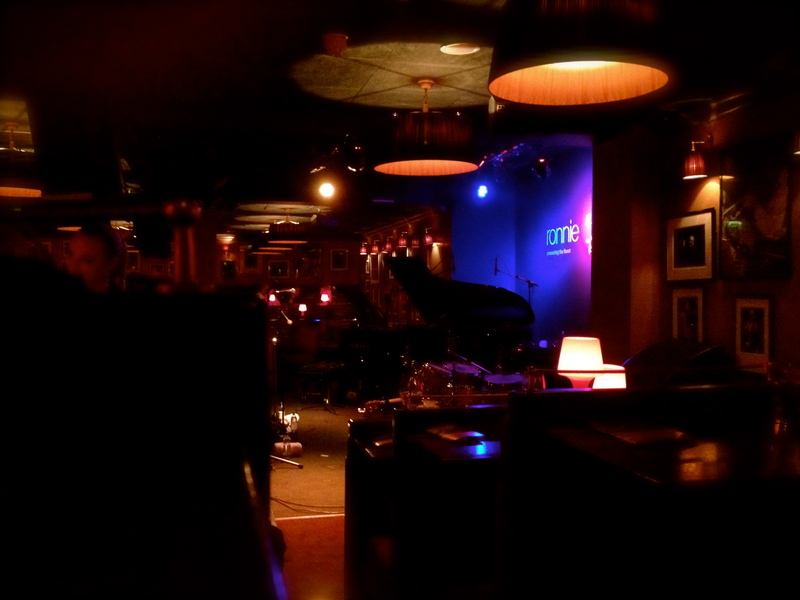 What follows is a VERY subjective account of my first visit to Ronnie Scott’s. It is more of an attempt on my part to incorporate something of a gonzo style of journalism into what I’ve done so far on this blog (and has been written primarily for entertainment purposes) then it is a real review of the evening I had. draw your eye to parts of the building, allowing the black against red light contrast to enjoy the fullest effect on passers-by. To me, it symbolised a link to the history of music, a chance to experience something close to the jazz clubs of yester-year and gain a better understanding of the music as a result. “Have you got a reservation?” From a man holding flyers on the front steps. I hadn’t noticed him, or maybe I’d ignored him whilst I was taking in the impressive exterior. I nodded, and, stepping under the dignified name above the door, we strolled past the illuminated upcoming events posters and double glass doors and took our first steps inside Ronnie Scott’s. Stretching out ahead was a corridor furnished with décor that implores you to think posh and luxurious, but which clearly has an ulterior motive: to last as long as practically possible under the weight of generations of music junkies. It sloped gently upwards, leading to a group of women looking intently at a clipboard. I guessed they were probably the people we needed to see first, so I ignored the knot of excitement and the rush of something like nerves which travelled up my spine and stretched itself out across the back of my brain. My head was swimming with excitement, but I managed to confidently approach them for verification that our places had been paid for in advance, and our seats were saved. The rush of nerves had first hit me on the tube, and they took me completely by surprise. My best guess at where they’d come from was my own desperate need for the building to be perfect, to be the all-embracing Cathedral to London jazz that I’d always imagined it as. At the time, my head was spinning with imaginary jazz establishments. I had a rough idea about what the stage looked like, but it was what the place felt like which really mattered to me. I wanted to immerse myself in a thick mire of jazz history, sinking into a warm comfortable bath designed to compliment the free expression on stage. I knew that I could soon leave the brightly lit steel cylinder, which could have represented man’s industrial creations, for a world constructed around entertainment, music and listening to the free expression of an individual amongst a group. The reality that greeted me as I followed our usher into the club was slightly different to what I’d imagined. The rush I’d had on the way to the venue ebbed away, leaving vague curiosity and wonder in it’s place. The furnishing looked exactly as I’d imagined and more, from the generally traditional feel of the auditorium and bar, to the tasteful touches of the modern where appropriate. Every single nuance was controlled and managed to give just the right amount of light, just the right ambience. The seats were mostly in dark, with a small orange lamp between two customers, encouraging you to remain silent. Most striking however were the tables in front of the stage, surrounded by a chest-high border made of smooth polished metal. It created a mythical separation, putting those willing to pay a little extra into a space of their own, as though they wanted to imagine they were at a private performance. Despite the effort and control that had gone into every other aspect of the building’s luminescence, the monitors on the tills continued to glare out at you once the lights were turned down and the show began. I didn’t think much of it at the time, but they seemed to reflect an uncanny niggling feeling at the back of my head. There was something like a dawning realisation occurring whilst the rest of me was pre-occupied with the staggering display of music on stage. The place had a slightly different atmosphere in the flesh to the romantic jazz clubs of my imagination. There was something about the way everything was set up. The impeccably arranged lighting, the service, the price of drinks and the harsh light from the tills created the impression that this wasn’t about the worship of jazz or music, it had much more of a focus on the paying audience. We had pockets deep enough to pay the entry fee and take advantage of the excellent hospitality. It was a church to jazz lovers, and how lucrative their passion had become for those who knew what they liked. It started to look less like we had been shown to our seats, and more like we had willingly hooked our wallets up to an automatic milking machine and been shown to our allocated shed.